Americans have funfetti. German chocolate cake (which is not actually German, go figure!). We can even count New York cheesecake under the banner of “Proud Cakes from the USA.” But we’ve got nothing compared to the Brits. 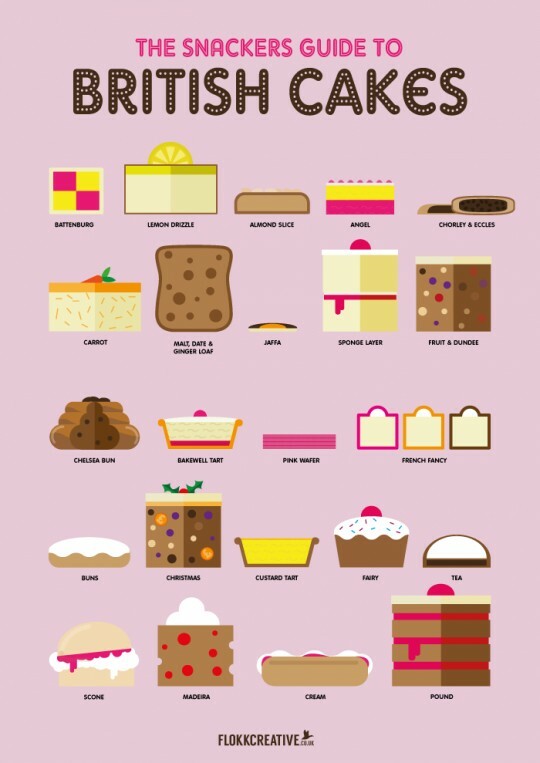 I love this infographic, designed by Flokkcreative, and the sheer variety of British cakes with amazingly quirky names like eccles (pronounced eckles) cake, Battenburg cake or Victoria sponge. What’s your favorite British cake? Posted on 17, March 2015, in Food and tagged American, bakery, Battenburg, British, cakes, dessert, eccles, food, funfetti, German chocolate cake, pudding, sweets. Bookmark the permalink. 1 Comment. The scone and the Chelsea bun, no doubt!